Welcome to Doodlecat, where we enjoy the pleasures of life (with a slight bias towards the outdoors). This page is regularly updated with news and views plus information about any additions or changes to the various parts of the site. It acts as Doodlecat’s Blog too, so the odd rant considered opinion may pop up from time to time. I would love to be able to say that Doodlecat is all my own work, but it isn’t. Much of the outdoors content is courtesy of the splendid people who participate in the annual TGO Challenge (there is a section entirely devoted to this unique event) and many others. To help in tracking down that elusive morsel on Doodlecat, the search facility under the title bar above is tailored to help you find it, either on this home page (Doodlecat's Blog) all the rest of the site (Main Site) or – if all else fails - the internet! So have a rummage around the old cat basket and enjoy your time with us! Friday night (18th) saw me and bro in law, David Hobbs back in Llangollen for another weekend’s walking. Having sussed that the best real ale pub in town as the Bridge Hotel (a very nice pint of Robinsons) this time we saved ourselves the effort of wandering the streets by booking a room there. The deal was very good indeed – a twin en suite room for two night’s B&B for just £90. That’s £22.50 per person per night. The money saved was invested in severalteen pints of Unicorn and Hannibal’s Nectar to fortify us for Saturday’s assault on the hills. We arose not too early. Not because of the night before, or indeed the sights before (Llangollen is still blessed with plenty of large young ladies in very small dresses of an evening). No, breakfast was not served until a tardy 9.00 am at weekends, which allowed plenty of time to stroll to the local shops to buy provisions before sitting down to a full English Welsh breakfast. To my alarm I had noticed that the TGO Challenge date was just six weeks hence, so I determined to test out my fitness level with a walk that would more or less equate to my first Challenge day, which is around 16k with 770m of ascent. I carried full kit, right down to tent and sleeping bag. To attain the required ascent we chose to bounce along the tops of Llantysilio Mountain, starting at the little car park at SJ 198433. From there we dropped down to the river and ambled to the ‘Horseshoe Falls’. In reality the falls are a weir which raises the water level to divert some of the flow into a channel which is the beginning of the Llangollen Canal. The canal is a real feat of engineering, hewn through solid rock in places, with Telford’s aqueduct across the Dee east of Llangollen an astonishing tribute to the imagination and daring of those 19th century engineers. A very strange thing around Llangollen is the number of abandoned caravans. Some small ones, others that were once very classy indeed, but wherever you walk, you’re never far from a slowly decaying caravan. It’s an easy enough haul up to Moel y Faen, although the first pinewood is a tad inconvenient to one with a full backpack, the trees plucking at the pack as I plodded through in the wake of the lightly burdened ‘Obbsy. As it was a fine day we stopped on Moel y Fan to enjoy the views which stretch as far as Liverpool, and I ate the heaviest part of my food. I’m sure that pack didn’t feel as heavy last May. Now, Llantysilio Mountain does not provide an easy ridge walk once you’re up there. It does go up and down (and down and up) quite a bit. 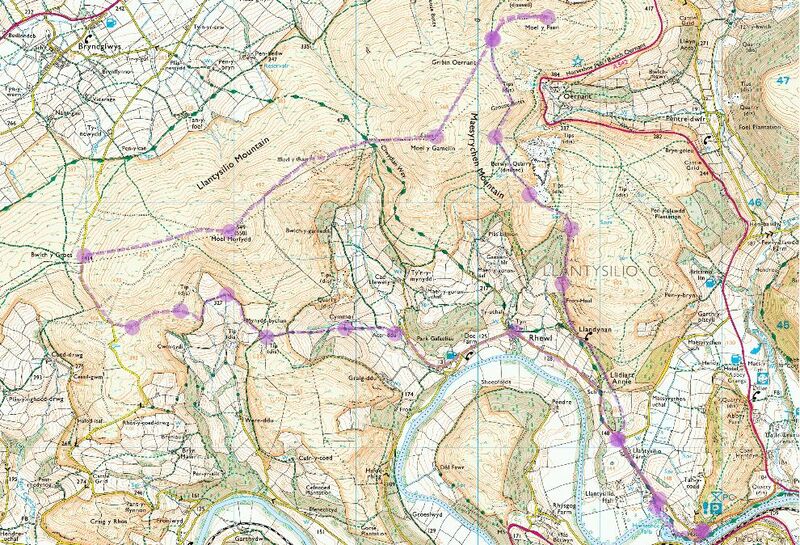 Nevertheless the route is popular enough to have a very clear path to follow, with spiffing views. We the went south west and up to Moel y Gamelin before plunging into a very steep descent to cross the Clwydian Way before staggering up to the old hill fort of Moel y Caer. Nothing remains here except the much eroded ditch and rampart, although some enthusiastic archaeologists had been having fun with their trowels on a minor excavation. On the way here we observed several bales of cut heather by the track – a lot of it strewn over the path. Whether this was by accident or intent I don’t know. It seems an odd choice of material for footpath conservation, and equally unsuitable for animal bedding. Any answers? Another down and up brought us to Moel Morfydd (and a trig point) with the delicious prospect of most of the route now being downhill. The route back was very pleasant easy walking, and finding the Sun Inn at Rhewl open was a real bonus – except for the fact that the beginning of England’s humiliation and loss of the grand slam was on the telly. Rather than suffer expert and critical commentary from our welsh co-drinkers, we made back to the car (as it happened, later in the day Wales got a drubbing too, so we didn’t feel too bad). I felt pretty good at the end of the day. 17k and around 700m of uphillness had been accomplished without too much trouble, and after the first shock of going uphill with a full pack, it wasn’t too bad at all. But we were pretty tired, and after a really good Indian meal and a couple of beers, we retired earlyish for a decent kip. 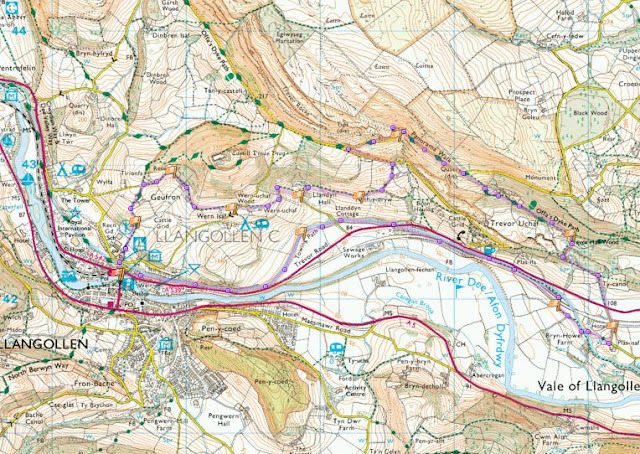 Sunday saw us up early and out immediately after breakfast for a scamper up to the Offa’s Dyke Path and the ‘Panorama Walk’, which indeed offers a fine panorama of the Dee valley. Another abandoned caravan or two en route, plus, at Llandyn Hall Farm, what I think might be an easily restorable Jowett sitting in a barn. We followed the trail towards Trevor before dropping down to the canal for a leisurely stroll back to Llangollen along the newly restored towpath. 10.5k and 300m ascent to loosen the legs before our drive home, which thanks to David’s turbo charged Swedish steed, was achieved in less than three hours. I rather like Llangollen. I may go back there again quite soon and introduce Miss W to its charms. There's plenty to see, both in scenery and smaller details that are equally delightful. To round off, here are a few more pics from the weekend. L-R David at the trig point, The Llangollen Canal, Could this be the fabled Green Man? (seen near Cymmo on Saturday). For those intrigued by the planning process and the personalities behind some of these projects, there is a four part documentary starting on BBC 2 this Thursday (March 24th) at 7.00pm. Could be interesting viewing. Thursday saw us motoring to the Yorkshire Dales for a couple of days R&R courtesy of the excellent Rick & Lindsey. And boy did we need a bit of relaxation once we finally arrived, having spent a not very happy hour or two on and escaping from a blocked A1 - it was a windy day and lorries seemed to be toppling all over the place. We heard on the radio that one poor soul had been killed by a capsized truck in Leeds town centre, which certainly put our moans and groans into perspective. But we were delighted to arrive in good time to share an evening and splendid dinner in the good company of Peter and Avril Goddard (aka Mr & Mrs Grumpy). Peter is a veteran of the TGO Challenge, and you can read about some of his early crossings in the TGO section. Avril will be manning Challenge control for the first week of this year's event, giving advice and encouragement as well as helping to ensure that 300 plus individualists are where they should be ... er, more or less. Wine was taken - stories swapped. Bed and oblivion followed. What better way to kick off the new day than a brisk walk before the inevitable Yorkshire rain drifted in? Fortunately no imagination was required on my part as our neighbour, an expatriate Yorkshire lass, had given us the latest copy of the Dalesman magazine, which happened to have a walk of just the right length starting a short distance away at Chapel le Dale - so off we went accompanied by Lindsey and Rick whose duties as a Park Ranger had him assiduously picking up any litter encountered en route (not too much I'm pleased to say). It's an ideal excursion for a morning or afternoon, shown on the map by the yellow highlight. We followed it in an anti clockwise direction. Navigation presents no problems, except maybe in mist or darkness on the higher part (although why you would want to do it in the mist or in the dark beats me). Although undemanding, it is quite interesting, and I do like a bit of interest in a walk. The walk proper starts by turning right just after the church. For those interested in things subterranean, Hurtle Pot can be peered into with a short diversion from the track, but as this involves hanging on to a rope on a steep muddy and slippery slope above a seemingly bottomless pit ... I decided to give it a miss and failed to mention its attractions to my companions. Plus of course, Hurtle Pot is the lair of the Boggart, who can sometimes be heard roaring and crashing far below. For years a statue stood on this spot until it was vandalised on Saturday August 27th 1983 and subsequently found in thirty foot of water at the bottom of Hurtle Pot. A team of divers made the recovery and it has been erected again as found. It was originally the creation of the late Charles l’Anson the well known sculptor and artist. Only time will tell if the spirit of the BOGGARD of HURTLE POT is enshrined in the statue. Passing the statue, past Gill Head farm we emerged from the woodland for a fine view of Whernside lit up by a shaft of sunlight as we headed up to Ellerbeck Gill. Away to the right we had an uncluttered view of the Ribblehead viaduct, many of whose builders lie buried in the small graveyard that we saw as we made our way past the church. At Ellerbeck Gill our route reached the line of an old packhorse route to Ingleton, and we turned left to follow it gently uphill to the limestone pavements that lie above Twisleton Scars. These are quite extensive and scattered with large erratics - boulders left by the retreating ice sheet at the close of the last Ice Age. All around are 'shake holes', holes in the ground where the rock has fallen through into underground chambers and tunnels carved through the limestone by thousands of years of rainfall. Some are filled in with debris and mere depressions in the ground - others look as though a false step could have you plummeting into the bowels of the earth. I view these with suspicion; MissW was happy to poke and prod at them whilst standing inside, risking life, limb and abduction by boggards (note to self - must increase her life insurance). As the path enters the exposed limestone, so it becomes a defined stony track. On the descent we took care to follow the path the "wrong way" towards Kingsdale, knowing that this was the 'zig' before the 'zag' that dropped us onto the green lane, from where we headed on to Oddies Lane, an old roman road. The walk back along the old roman road to the start point is quite scenic and pleasant. A road walk, but hardly tarmac bashing in this rural backwater. I love abandoned machinery and ramshackle buildings, and Twisleton Dale House provided both. A gloriously asymmetrical edifice, slowly crumbling along with its associated bits of farmyard machinery and weathered misspelt signs displaying highly optimistic parking fees. Back at the car we took a little time to explore the tiny church. Although so many of the workers and their families from the shanty towns that grew up around the great viaduct are buried here, there are no marked graves. In the church is a tablet to their memory, and there is a small, quite recent memorial near the large sunken area where their remains lie. I would say that it was a splendid weekend, but on our return on Sunday we had some sad news. We walk a couple of dogs for the Cinnamon Trust, and one of our charges, a delightful black Labrador Retriever called Barney had died whilst we were away. We had been out with Barney the very morning that we set off and he had really enjoyed his last walk. 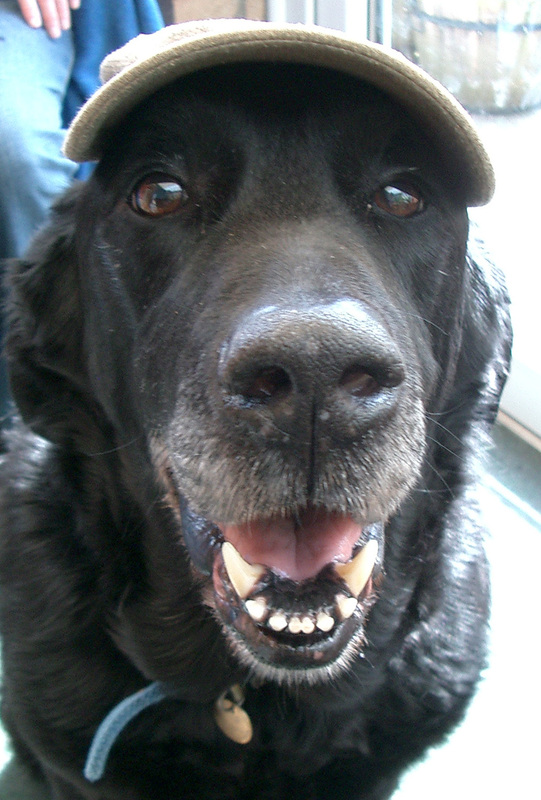 Barney had been ill with cancer for some time, and it was a real shame that we weren't around to say goodbye. He was a cheerful chap who enjoyed life and got a lot out of his walks in the local forests - right up to the end. A lovely companion, we know his mistress will miss him. 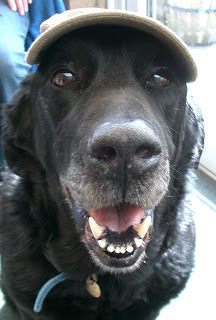 Here he is, looking cheerful, wearing my TGO cap. Not my trip reports, sadly. They are better presented and better written than any of my efforts, with grab & drag maps for the routes and a superb accompanying text by John Hesp. Followers of the TGOC Message Board will probably have already caught these, but if you haven't, and you're interested in backpacking in Scotland, then these are well worth a visit. Both are now indexed on the TGO Challenge pages.